Finally, here it is. The promised English translation of Cuddly. Please let me know if you have any questions. Enjoy! 1 ball of yarn. I've used Paris from Garnstudio and Sublime Cotton, among others. Cast on 3 sts using your desired cast-on method. Continue with YO on every row before the last two stitches (border sts) until you have 50 sts in total. Put on a stitcholder and repeat the process. Once you’ve got your two triangles, hold both needles with stitches together and bind the first 20 sts off together. Place 10 sts on holder and knit 10 from other needle (20 sts on holder for head) Bind off last 20 stitches together . Place sts from holder onto needle and knit back and forth for 15 rows. Place 10 sts onto each needle and knit the 3 first stitches together. Bind off the next 4 sts on both needles and knit the last 3 sts. Each ear is now worked separately. Continue in this manner until you have 11 sts. Pull end of yarn through loop and secure tightly. Sew seam on side of head. Make a loose ball of remaining yarn and stuff the head. Sew seam under head. Secure all ends and embroider on eyes, nose and mouth if you wish. You can also thread a ribbon through the holes and tie a little bow in the angle. Just be sure you secure the bow. 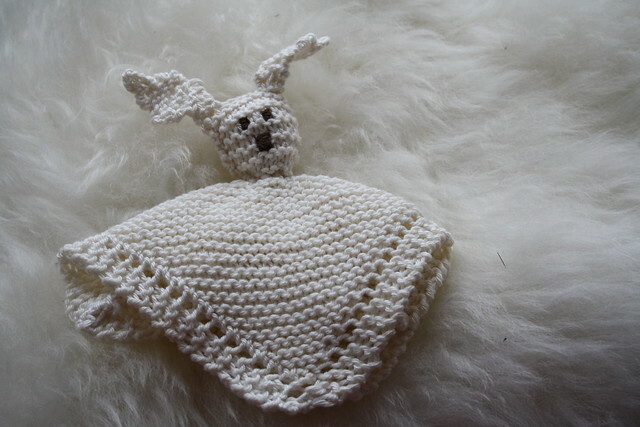 And voila- Your very own Cuddly bunny is all done and ready for heaps and heaps of cuddles and love. This pattern is intended for personal use only and although you may share it with your friends, I would appreciate it if you didn’t sell either finished bunnies or the pattern itself. Thanks. Thank you! I got to the part with the head using your Norwegian pattern and then I got stuck. LOL Now I can finish this and it will show as the first project for the English pattern on Ravelry. Thank you! I know a baby who needs one of these soon.